Dramatic Tors, breath-taking reservoirs, rugged landscape and barely another sole in sight; you can expect to find this and more in the Mourne Mountains, Co. Down. 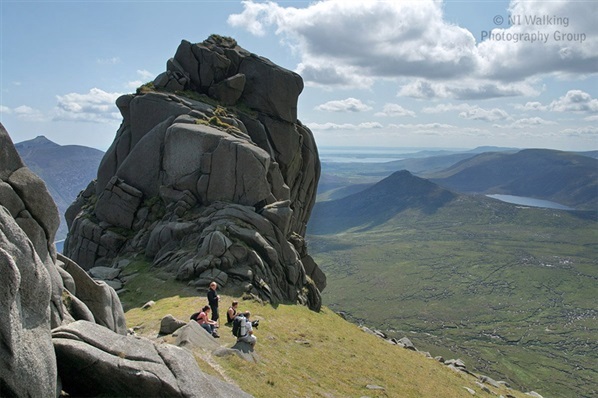 The highest and most dramatic mountain range in Northern Ireland, its summits are crowned by granite tors with a network of paths and tracks, providing incredible opportunities for exploration. The beloved inspiration for CS Lewis’s fictional land of Narnia with all mountains situated within a relatively small geographical area the beauty of the Mournes is that you can conquer and explore a vast variety of the hills all within a matter of days and all from one base. With this in mind, we have designed a variety of walking itineraries coupled with some great offers in nearby walker friendly accommodation to enable you to get the best out of a short break in the Mourne Mountains. Two of our favourites are below however for even more itineraries download the free ‘Mourne Mountains Walker’s Guide’. A challenging 3 day itinerary climbing the 6 highest peaks in the Mournes including Slieve Donard, Northern Ireland’s highest summit at 853m / 2,798ft. 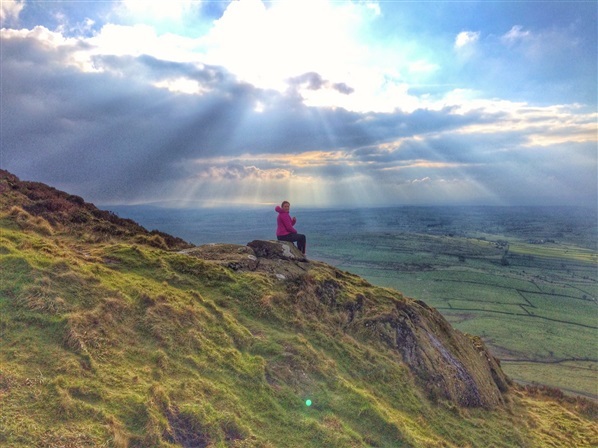 As the name would suggest this itinerary requires a high level of fitness but rewards walker’s efforts with breath-taking views out over the Irish Sea and beyond! 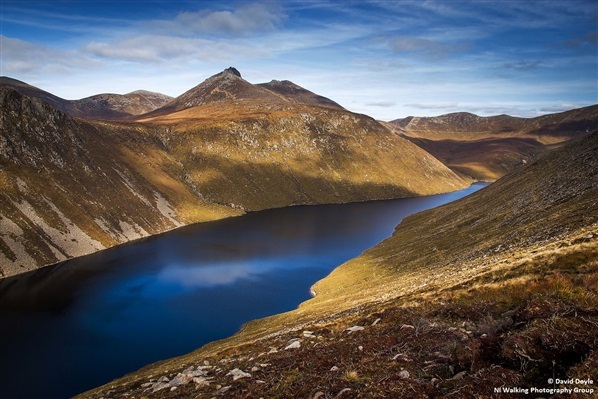 A challenging circular walk with some strenuous ascents, this route takes in 3 of the highest peaks in the Mourne Mountains (Slieve Donard 853m, Slieve Commedagh 765m, Slieve Bearnagh 739m) with wonderful views out to the Irish Sea and back into the High Mournes. The route follows part of “The Brandy Pad”, a track created by the boots of smugglers and the hooves of heavily laden ponies, particularly during the 18th and 19th centuries. 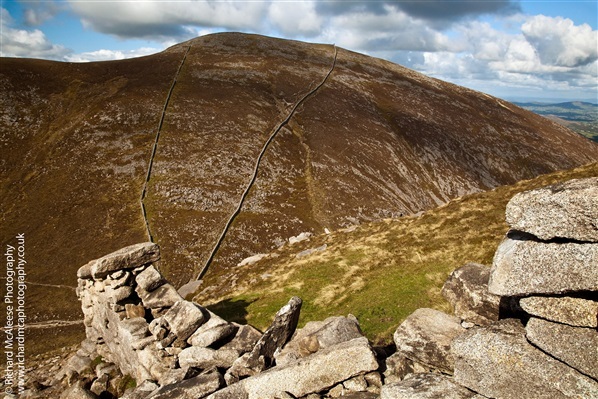 This fantastic circular walking route follows the Mourne Wall to the summit of Slieve Binnian (747m). It then traverses between the spectacular South and North Tors with stunning views of Silent Valley and Ben Crom Reservoirs before descending along a track past the Blue Lough, Annalong Forest and back to Carrick Little car park near Annalong village. Between 1904 - 1922 many skilled people were employed seasonally to build the Mourne Wall which stands up to 8ft high and 3ft wide and took 18 years to complete. 22 miles (35.5km) in length it connects the summits of no less than 15 mountains, including Slieve Donard. This is a moderate circular walk in the Mournes, summiting 2 of the 7 highest peaks in the region, Slieve Meelmore and Slieve Meelbeg. The walk starts and finishes from Ott car park ascending to the col between Slieve Loughshannagh and Carn Mountain before following the Mourne Wall to the summits of Slieve Loughshannagh (619m) and Slieve Meelbeg (708m) and up to the summit of Slieve Meelmore (687m). Once at the bottom of the valley, the route picks up the Ulster Way, passing Fofanny Dam. For those only in the Mournes for the weekend, these 2 invigorating days are perfect to fit in some of the highlights of this spectacular range. 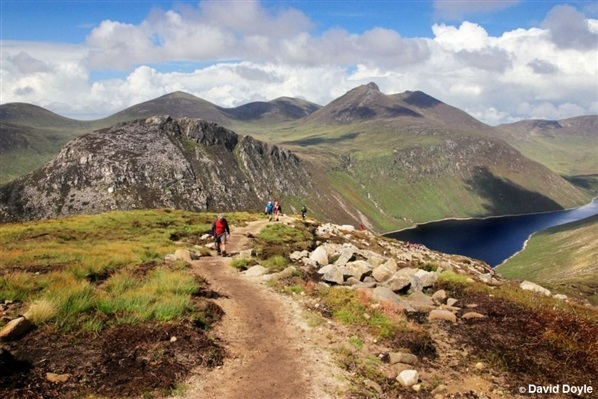 This itinerary summits Slieve Binnian and Bearnagh with the option of scaling Slieve Donard, all of which will reward walkers with breath-taking views over the South Down and County Armagh landscapes. A strenuous linear walk linking the southern end of the High Mournes to Newcastle via Slieve Binnian, Slievelamagan and the Glen River. Impressive views of Silent Valley Reservoir can be enjoyed from Slieve Binnian and of Ben Crom Reservoir from Slievelamagan, both of which supply Belfast with piped water. The walk starts near Annalong and finishes in Newcastle. From the top of Slieve Donard, on a clear day, walkers can see out over to England’s Lake District, Dumfries and Galloway in Scotland, Snaefell on the Isle of Man, the Scottish island monolith of Ailsa Craig and the Isle of Arran. A strenuous walk in the Mournes taking in the peaks of Slieve Bearnagh and Slieve Meelmore, finishing by walking down Happy Valley and along a section of the Ulster Way. This is a circular walk using the Trassey Track as the gateway to the core of the High Mournes. 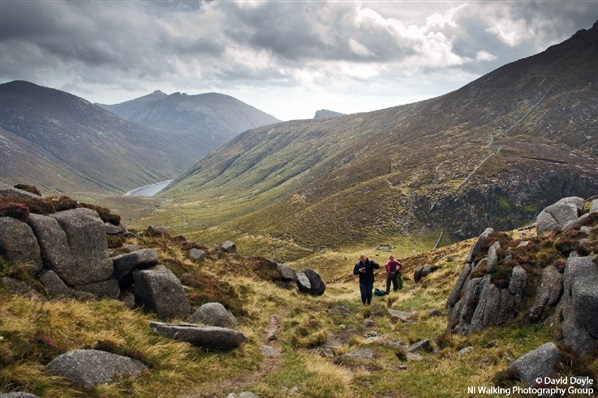 Activities in the Mournes Shuttle Services (AIMSS) provide a shuttle service to walkers in the Mourne Area. Contact 07516 412076 to book. Translink operate a dedicated “rambler” bus service through the Mournes from May-September; Tuesday to Sunday. There are a number of small towns and villages dotted around the foothills of the Mourne Mountains all which make a great base for walkers. Newcastle, a coastal resort around 31 miles (50km) from Belfast and 87 miles (140km) from Dublin, is probably the most popular town located at the foot of Slieve Donard. 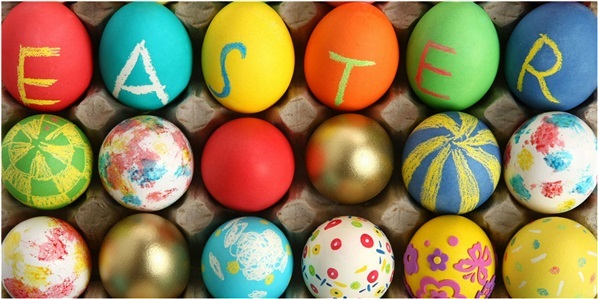 There is no need to struggle with ideas to keep the kids and teens amused over the Easter break. Check out our list of outdoor activities on offer this year to ensure you have an eggcellent Easter. 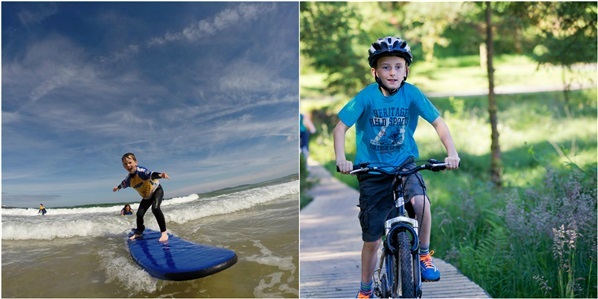 Whether you plan on joining in on the fun for a family day out or are looking to leave the kids to it at one of the many adventure camps taking place there is lots happening in the outdoors over the holidays. Hold on tight as you whizz across Strangford Lough in a high speed boat. Take in the spectacular views of this area from the water as you travel out to the Sea Gen and spot seals and whirlpools. 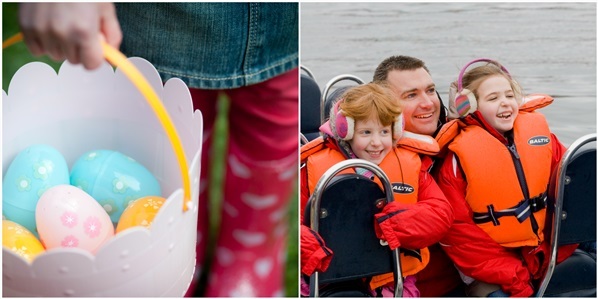 Find the Easter treats and surprises hidden along the trail by the Easter Bunny before hopping on board a boat to cruise around the lough. Enjoy 3 for 2 entry to an action packed family day out climbing, kayaking, archery, zip lining and more. With a whole range of activities including body zorbs, archery, climbing, paintball target shooting, segways and more, nobody will be complaining of being bored this Easter break at the JungleNI. Leave the kids to it with friends their own age for a few action packed days of outdoor adventures. Come down to the beach and enjoy a weekend of professional surf instruction to introduce the kids to surfing. Pay per session or book all 3 at a reduced rate. Minimum age 8 years old. The kids will be introduced to the skills needed to hit the trails confidently and safely during this specially designed mountain bike kids camp. Suitable for children aged 7 to 14. Drop your kids off, on the way to work, for three fun filled days of activities in the heart of the city. Suitable for ages 8 and over they are sure to have an exciting few days of activities including canoeing/kayaking, orienteering, archery and having a go walking on water in Water Roller Zorbs. Avoid boredom setting in and drop the kids off for a couple of days of action packed fun at Belfast Activity Centre during the Easter holidays. Activities will included: caving, climbing, mountain biking, bushcraft, team games, nightline, archery, easter egg hunt and more. 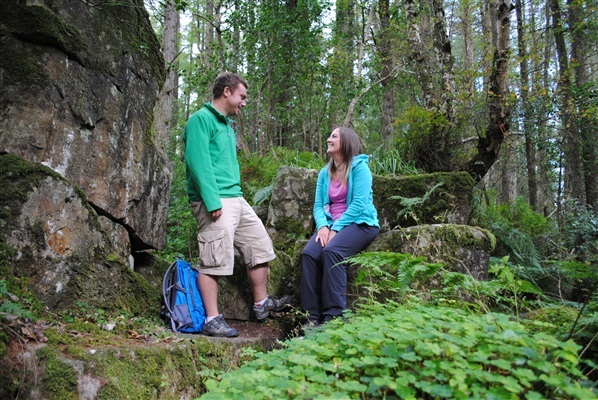 For even more events happening over the Easter break check out OutdoorNI. Slemish Mountain rises 1500 feet (437 metres) dramatically above the rural plains to the east of Ballymena. The central core of an extinct volcano, this breathtaking monolith dominates the local landscape however its value as a heritage site is entirely bound up with its association with Saint Patrick. Legend tells that Saint Patrick was captured and brought to Slemish to work as a shepherd under a man named Miluic for around six years. After his escape, many believe that Patrick planned his now famous journey back to Ireland to convert his old master and one of Patrick’s churches is thought to be at the site of the nearby Skerry Churchyard. 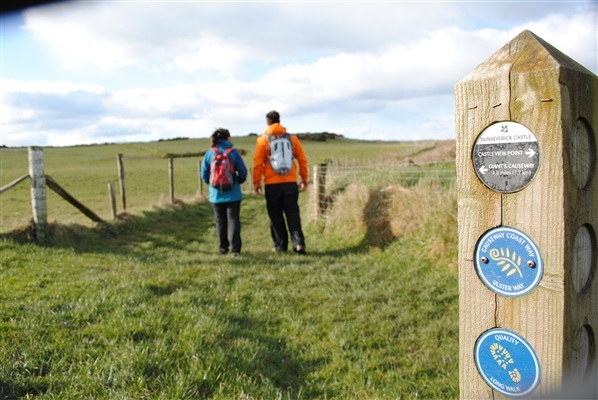 Starting in Downpatrick, the medieval capital of County Down this 4 mile linear walk is steeped in Irish Christian heritage and is a section of the 40 mile Lecale Way stretching from Strangford to Newcastle. 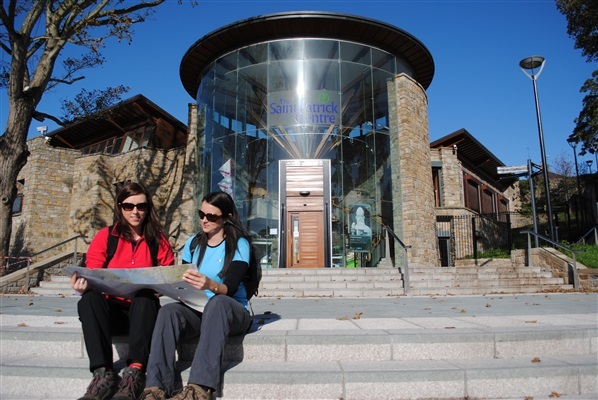 The walk starts outside the St Patrick’s Centre in Downpatrick, an interpretative exhibition which tells the fascinating story of Ireland's Patron Saint and the arrival of Christianity to Ireland with the option to visit Down Cathedral, where Saint Patrick's remains are buried. 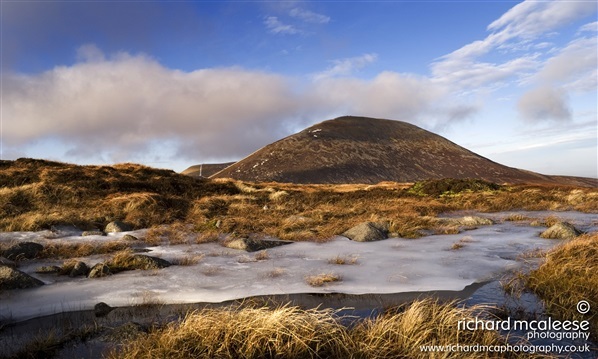 The highest and most dramatic mountain range in Northern Ireland, the Mourne Mountains have more than one association with Saint Patrick. He is thought to have visited the Mournes on his first landings to Ireland and converted the local hill folk to Christianity and it is at the foothill of Slieve Donard, in Newcastle where popular mythology states he famously banished snakes from Ireland. Further into the mountains themselves where a small stream marks the boundary of the Kingdom of Mourne legend has it that there is a rock in the stream with Saint Patrick’s hand print from where he knelt down to drink the water. This well maintained walkway follows a key section of the longer Causeway Coast Way & Ulster Way. Nearly 5 miles in length, this section of coast from Giant’s Causeway to Dunseverick Castle is officially referred to as the North Antrim Cliff Path (& maintained by The National Trust). The spectacular cliff landscape & rich biodiversity of the coast merges effortlessly with the surrounding farmland. Ending at Dunseverick, Saint Patrick is recorded as having visited the castle in the 5th century AD, where he baptized Olcán, a local man who later became a Bishop of Ireland. Little now remains of this ancient promontory fort, which was eventually sacked by Vikings and fell into ruin, being replaced as a local stronghold by Dunluce. Steeped in local myth and legend, the Sliabh Beagh Way meanders through the valleys of Co Tyrone, the drumlins of Co Monaghan and the lakeland of Co Fermanagh. The first section begins on country lanes and will take you to St Patrick’s Chair & Well (also known as the Druids Chair and Well or St Brigid's Well or St Brigit's Well) in Altadeven Wood. Tradition relates that St Patrick said mass in the Chair and blessed the nearby Well. However it is likely that the site's importance predates St Patrick. The name Altadaven translates as 'Glen of the Druid, or Devil' and archaeological evidence indicates that the Chair was probably also used for pre-Christian rituals. 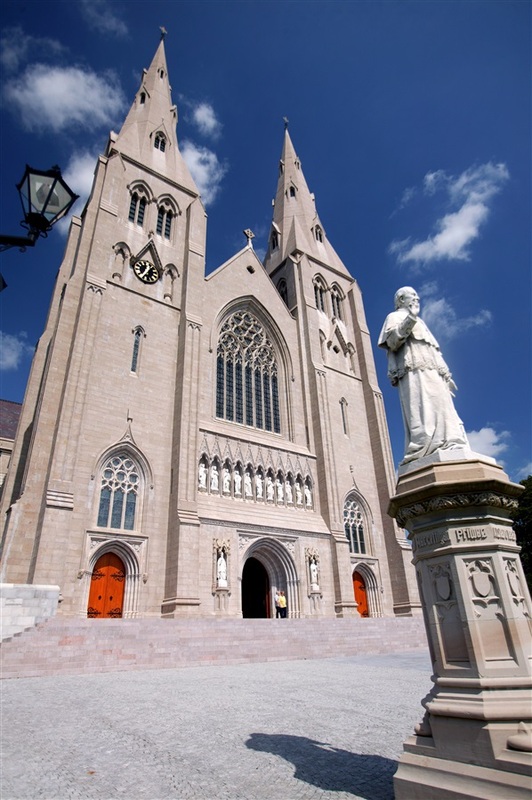 Armagh is one of the few cities in the world which is home to two cathedrals both named after the same saint – St Patrick. Located just a ten minute drive from the city centre you will find Gosford Forest Park boasting 240 hectares of mixed woodland; the perfect place to enjoy a slice of countryside near the city. The one mile ‘Castle Path’ takes in the Arboretum which boasts a variety of individual, conifer and broadleaf tree species from around the world, some of which are over 150 years old. Alternatively the two and a half mile ‘Greer’s Trail’, takes in Dean Swift’s Well and Chair before reaching the Millpond where the gateway to the original home of the Earls of Gosford can be found. When people talk about the highlights of Northern Ireland’s North Coast, the Giant’s Causeway UNESCO World Heritage site is often top of the list, closely followed by Carrick-a-Rede Rope Bridge and the Bushmills Whiskey Distillery. However, ‘Beyond the Giant’s Causeway’ there lies breath taking landscapes and spectacular walking routes just waiting to be explored. Offering unparalleled views of the Atlantic Ocean from cliff top paths with dramatic cliffs and sandy beaches the 53km ‘Causeway Coast Way’ from Portstewart to Ballycastle along Northern Ireland’s most celebrated coastline, still remains largely untouched despite hosting some of Northern Ireland’s most famous tourist attractions. 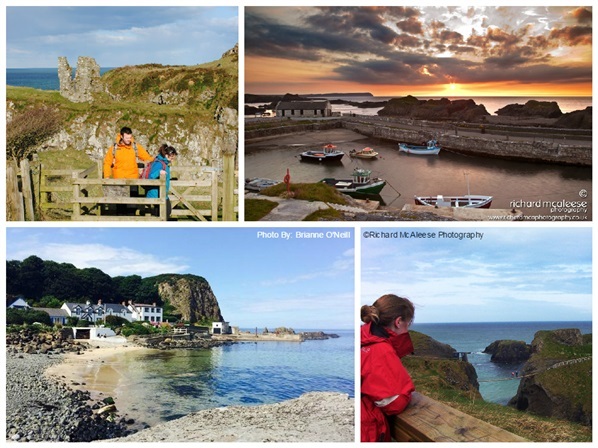 Widely regarded as one of the finest coastal walks in Europe, the Causeway Coast Way is a relatively flat linear route best enjoyed over 2 days, during which you can escape from the crowds and immerse yourself in the history and geology of the area all whilst covering plenty of ground underfoot. Approximately 262km from Dublin the Causeway Coast Way is easily reached by both car and public transport links. A Causeway Rambler bus service is in operation May through September with a number of stops available along the linear route. The walk on day 1 takes walkers on the first 3 sections of the Causeway Coast Waymarked Way. Beginning at St Patrick’s Well at the head of Portstewart Strand, this route follows the coastline via the cliff path as it passes the holiday resort of Portrush and the spectacular 16th century Dunluce Castle perched on a crumbling basalt outcrop above the pounding surf before reaching Portballintrae. The walk continues alongside a section of the Giant’s Causeway and Old Bushmills Railway to reach the Giant’s Causeway UNESCO World Heritage Site. Best place for food: The Ramore Wine Bar is renowned for its great food and lively atmosphere. A favourite of professional golfer Darren Clarke, this wine bar by the harbour in Portrush is a great place to settle in and sample the relaxed way of life on the North Coast. Harry’s Shack based right on the beach in Portsetwart serves fresh local fish, meats, & home grown vegetables. Opened in 2014, the award winning eatery has been receiving rave reviews since. 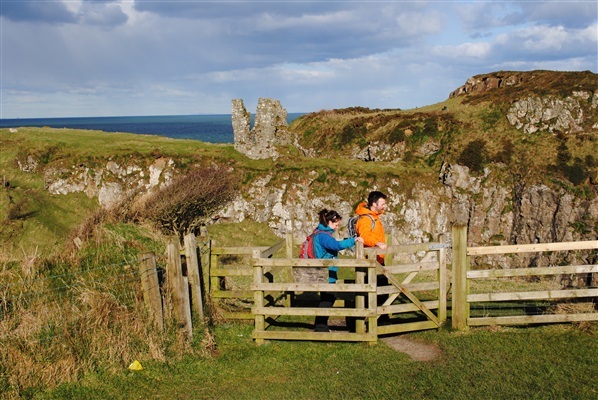 Day 2 of this itinerary takes walkers round Benbane Head and past the ruins of Dunseverick Castle and is officially referred to as the North Antrim Cliff path. After reaching the tiny hamlet of Portbraddan, the route follows the sweeping sands of White Park Bay (one of the first places in Ireland to be settled by Neolithic communities) around a headland of jumbled boulders and sea stacks to the picturesque harbour of Ballintoy. A short detour here will take walkers to Carrick-a-Rede with the opportunity of an exhilarating walk across the world famous rope bridge. Ballintoy’s hidden beauty is found at the end of the harbour road where you will find a small beach and a limestone harbour dating back to the 18th century a picturesque end to your walk. In recent years this harbour has been a key film location for the television series Game of Thrones. For those who wish to continue further along the coast, once at Ballintoy there is an option to continue for a further 9.7km on road to Ballycastle. Often walkers prefer not to walk this section. Best place for food: Roark’s Café in Ballintoy Harbour is one of the most idyllic cafe locations in Northern Ireland. A must for a quick snack or a hot drink when out walking along this coastline (Seasonal opening hours apply). Also based near Balllintoy Harbour another great place open all year round is the Red Door Cottage Tea Room - a traditional Irish cottage with real turf fire, it is the perfect place to stop for a tea and scone or something more substantial. 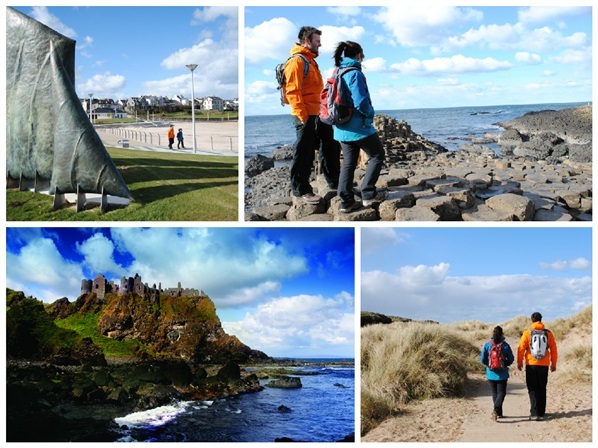 The route starts at Portstewart Strand with the nearest accommodation in Portstewart town or 1 mile away in nearby Bushmills and ends in Ballycastle all of which have a wide range of walker friendly accommodation to choose from including B&B’s, guesthouses and self-catering accommodation. All accommodation providers listed below are currently offering some fantastic offers for walkers from 1st March 2015 – 31st May 2015. Contact accommodation providers directly and quote ‘WalkNI’ when booking to avail of the offers. 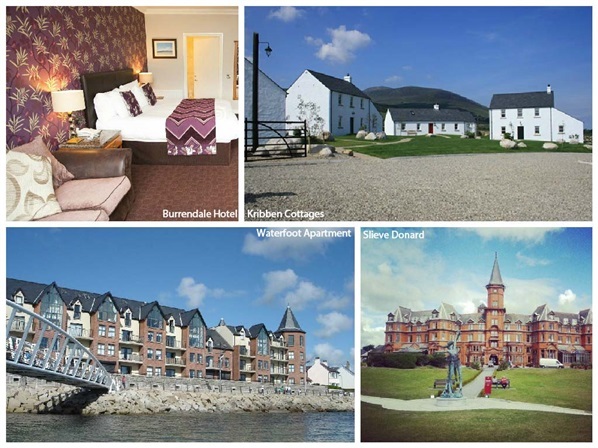 For full T&Cs and a full list of all walker-friendly accommodation offers across Northern Ireland visit the accommodation section on WalkNI.com. More information on this route can be found by visiting WalkNI.com where you can download the free ‘Causeway Coast Way Guide’ as well as the ‘North Coast & Antrim Walker’s Guide’ including route descriptions and maps for you to plan your walking trip and make your own discoveries ‘beyond the Causeway’. 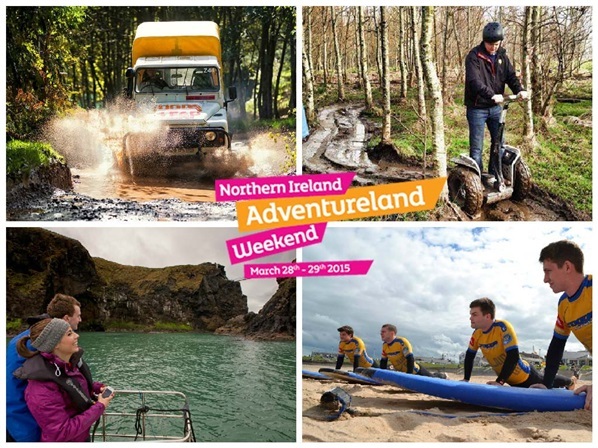 On 28th and 29th March 2015 Northern Ireland is being transformed into an action packed adventureland. With outdoor activities for just £10 and a massive 50% Off normal prices there has never been a better time to have an adventure. No experience is necessary and you don’t need a big group to book so round up your mates or go it alone this is one weekend of events you don’t want to miss! With fantastic activities at such great prices the events will sell out fast so make sure to book your place now. Make a break for the beach and get set to catch your very first wave as you learn to surf with Northern Ireland’s only Quiksilver approved surf school. Experiences instructors will teach you how to paddle, pop up and surf safely with confidence during this 2 hour session. Test yourself around a Segway skills course followed by an off road challenge! You’ll spend the session getting to grips with the unique and thrilling two wheeled machines, honing your skills before heading off on a guided off road adventure. compete against others, or bring your friends along to see who will be crowned champion. Feel the wind in your hair as you leave Ballycastle Harbour behind and take in the beautiful cliffs of the North Coast. See Kinbane Castle as you head up to Carrick-a-rede Rope Bridge, before crossing over to Rathlin Island where you will have the chance to go ashore and explore this unique island. A fun, exhilarating yet relaxing activity Stand Up Paddle Boarding involves standing or sitting on a long board and propelling yourself across the water using a paddle. You will be shown the basics of balance and using the paddle before taking a tour around the scenic lake. A unique obstacle course set in the canopy of The Jungle NI's forest. Will you be able to tackle the 50 exciting obstacles up to 70 feet above the ground?! Obstacles such as rope bridges, scramble nets, zip-lines, Tarzan swings and the Power Fan Drop will be sure to keep your adrenaline pumping! Experience pulsating action on Todds Leap’s most extreme outdoor activities – take a giant leap of faith from their 30ft Drop Zone, zoom down a 500 metre zip line and finish with a white knuckle, high speed hill rally! Perfect for those with little or no previous experience who want to become more independent in using an indoor climbing wall. You’ll get to learn the basics before finding the best route to the top! A great introduction so you can head back and enjoy indoor climbing on your own with confidence. The fantastic scenery of the North Coast will provide the perfect backdrop as you get involved with hoisting and trimming sails and learn how to pilot the boat from your onboard skipper. Perfect for beginners or for those who've already had a go at sailing and want to get more time on the water. A must for any Game of Thrones fans, step into Winterfell and recreate the famous scenes by having a go at archery in the very place where the BAFTA award winning TV show was filmed. Introduce yourself to the adventurous world of sea kayaking on the stunning North Coast. Experienced instructors will teach you in the safety of the harbour before guiding you along part of the North Coast Sea Kayak Trail. Wet bouldering is all about the water – make your way up a river, jump into pools and climb up waterfalls on this wet and wild experience.